Corning has been one of the leaders when it comes to smartphone glass. The company, which has unveiled curved and thin smartphone glass in the past, has now come out with an anti-microbial smartphone glass – a glass which doesn’t catch germs, which will be a boon for all germophobes out there. 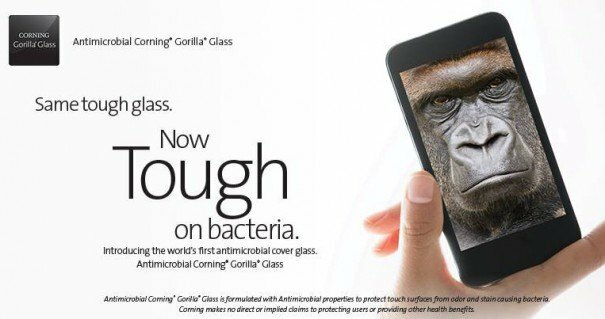 The Corning Gorilla Glass with antimicrobial coating will pack in an antimicrobial agent which kills germs present on your smartphone display easily. While smartphones aren’t generally considered as vectors of communicable diseases, since everyone generally keeps their smartphones to themselves, but they are in due course of time touched by other people too. The Corning Gorilla Glass will obliterate germs with its ionic silver coating. Some of the top companies have already started investing in the new Gorilla Glass and we hope we can see a smartphone with it by the end of the year.